A veces, los cruceros de observación de ballenas en enormes barcos hacen que sea difícil poder ver la vida del océano a menos que subas primero y reclames los mejores lugares. Este tour de observación de ballenas desde Husavik está a bordo de un bote RIB limitado a solo 12 pasajeros, por lo que nunca compite por los mejores puntos de observación. Además, es fácil mantenerse abrigado y seguro con un traje de abrigo incluido y un chaleco salvavidas. Observa la vida en el océano durante este tour de avistamiento de ballenas desde Husavik. Despite the fact that it started raining hard during this trip and we got quite wet, we still really enjoyed it. We saw humpback whales, one was fin slapping and jumping, enjoying himself and at the end we saw two whales swimming together. We were well looked after by this company and would recommend them. Excellent trip. The guide was very knowledgable and the boat captain was patient and very nice. We saw several humpback whales on our trip. I chose the RIB boat because I get sea sick. I did not feel nauseous at all on the trip. It was great to have a fast boat so they we could speed towards a water spout when we saw it. Also, having a small group on the boat we were 4 was so much better than having 40 people as seen on the bigger ships. Would highly recommend despite the higher price. Great experience!! Very friendly and helpful staff. We saw four whales and one of them did some amazing jumps, from a close distance. 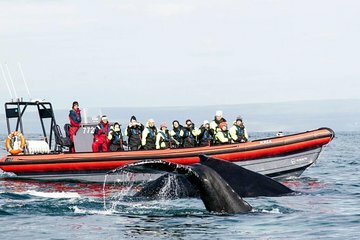 Due to the speed and flexibility of the RIB boat we could reach the whales fast and do the whole tour within 2hrs, which is very important. If you sometimes feel dizzy in the see the RIB boats could limit that compared to the other boats offering whale watching tours. Totally recommended it despite the fact that in general these tours are, for me, significantly overpriced.